Canvas @ YaleInstructor Guides AssignmentsHow do I Grade Assignments? 2. Click the link (or name) of the assignment that you would like to grade. 3. Click on “SpeedGrader” on the right-hand side to begin grading. Zoom: Click on speedgrader on the right-hand side to being grading. A. Student’s name which work is being currently displayed. You can work between students using the left and right arrow. B. In-line grading functionality. You can leave comments on the student’s work without having to download the document onto your computer. C. Preview of student’s file. 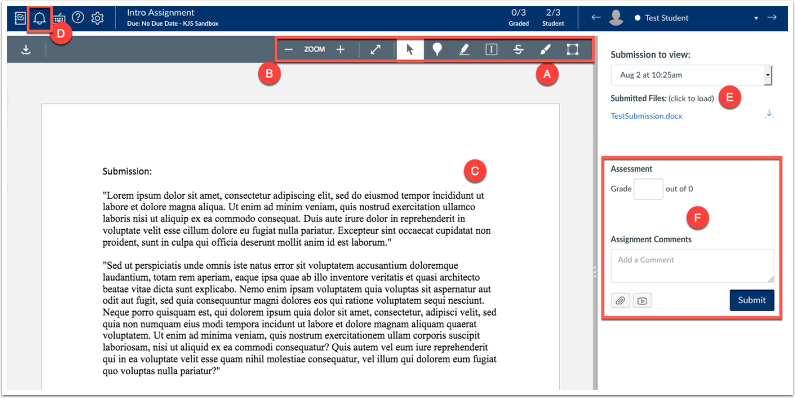 You can use the in-line grading functionality on this preview and the students will see your comments. D. By muting the assignment, you can hold off on student’s receiving feedback until you unmute the assignment. E. If you would like to download the student’s file, you can find the submitted files here. F. This is where you can grade and provide feedback. By clicking “Submit Comment”, you will be submitting the grade. Next: How do I create Media Recording Assignments?